Home boarding, house sitting or kennels? We all look forward to holidays as a welcome break from the hurry and busyness of everyday life, but deciding where to leave our dogs to go on holiday can often be the cause of significant anxiety and stress. Deciding to leave our non-human family members behind is bad enough, but finding someone we can trust with their safety and well-being in our absence can feel like a minefield. Some of us may have a family member, with experience and understanding of the needs of our dogs, and with the time to devote to looking after them for us. However, for many of us this is not the case and we are faced with looking at the alternatives and trying to make a decision that feels right for us, our dogs and our blood pressure! What about home boarding? Should we opt of house sitting for our dog? Would they enjoy a stay in kennels? house sitting, where the dog(s) are cared for in your own home by someone who stays there for the duration of your holiday. 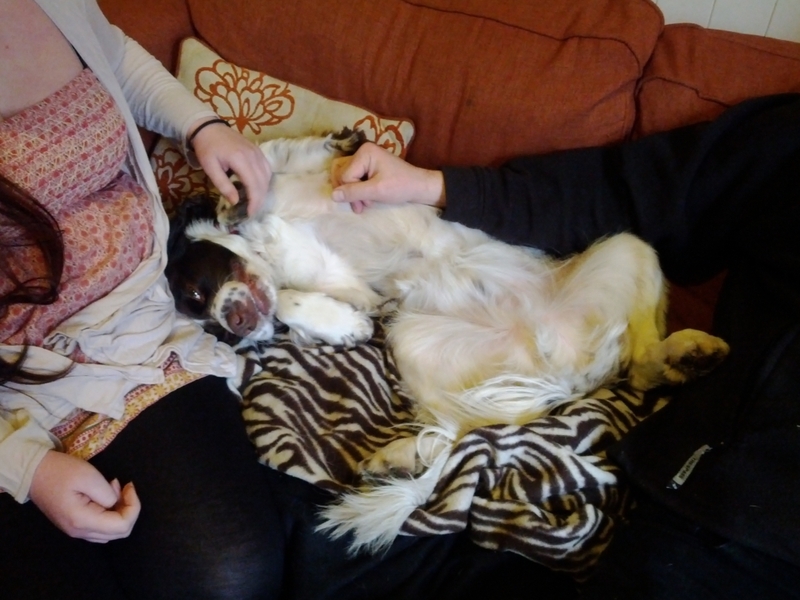 home-from-home boarding, where the dog(s) are cared for – often alongside other dogs – in a carer’s home. boarding kennels, where the dog(s) are cared for in a cage, pen, room or run of some kind as part of a larger establishment. The quality of all of these types of care can vary enormously from place to place and person to person. House sitting is near full time service – the pet carer is generally expected to spend a large proportion of each day (and sleep overnight) in your home, and is often thought to be prohibitively expensive. However, some companies – like our own – offer this service for the same cost as home-from-home boarding. The dogs do not have the stress of settling into a new environment, which is helpful if your dog is anxious or tends to suffer from separation anxiety. Close to 24 hour company. Other pets can also be cared for often without much extra cost. Your home is not left empty for the duration of your holiday. No other dogs or children will be present. Perfect for dogs who are not particularly sociable with other dogs or are unreliable with children. The sitter will use your heating, water etc., increasing your costs. No other dogs will be present – a shame if your dog enjoys the interaction. You have to establish greater trust from the outset to leave your home – as well as your dog – in someone else’s hands. Relaxing with a substitute family! Home boarding is designed to be a close approximation to the care your dog receives at home. You dog is accepted as part of a substitute family (in the absence of his own), and is able to carry on with his normal routines and care. In my experience, after a short period of ‘settling in’ (usually less than 24 hours), most dogs adapt to life in their new family without event and thoroughly enjoy their holiday. Usual care and routines can be maintained. Substitute family present for dog to bond closely to. A small number of other dogs might be present, a bonus for sociable dogs. The carer will be using their own heating, water etc., reducing your costs. Dogs with anxiety issues will have to deal with a new environment, as well as new humans. Many home boarders won’t take sole boards (where your dog is housed without any other dogs), or may charge you a higher rate, so it may be hard to find a home with no dogs if your dog isn’t too sociable. If the person offering home boarding doesn’t have a back up plan, you may be left with no cover if they are ill or have a personal issue at the time of the board. Many home boarders are one person traders. This can affect how much company your dog gets if they also offer home visits and dog walks, which will take them away from the home. Kennels and hotels are designed to take in large numbers of dogs at the same time. This means that each dog has to be contained in a single kennel, run or room, to keep them separate from other boarders, as they do not have continuous human company/supervision. Individual care varies between establishments and will include some form of exercise for boarded dogs, plus a period of individual attention each day. Kennels and animal hotels range from bleak, noisy places to comfortable rooms with couches and TVs! Usually slightly cheaper than other alternatives. Often have their own exercise field, so dogs may be able to have some off lead play, even if they can’t usually do this. Senior staff often very experienced. Individual attention and human contact might only be a few hours in each 24 hour day. Often very noisy creating anxiety for many dogs. Environment can be harsh for dogs who are used to sofa time. Greater risk of infection – will need kennel cough vaccination, which is not needed for the home based alternatives. Your dog will have to adhere to the kennels’ routines and this can be hard for some dogs. If you decide to use a dog sitter or home-boarder to provide holiday care for your animals your next question is probably how on earth do you find someone you are willing to trust with your beloved pets and the keys to your home? I will try to dissect and answer this question in the article Choosing a dog carer. ← Dog walking – whose walk is it anyway?